Pasture spraying is an important part of paddock maintenance but may not need to be carried every year if the paddock is well maintained and healthy. Weeds will appear at some stage and are easily dealt with by spraying selective herbicides. 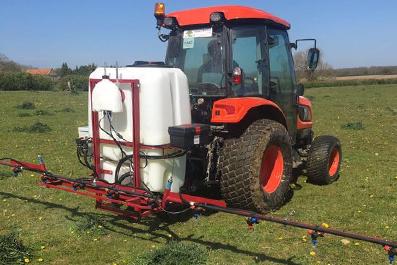 Compact tractors fitted with a modern sprayer can spray areas where it is too small for large agricultural sprayers to work in. Pasture spraying manually with a back pack sprayer can be tedious and does not always give the required results. Spraying herbicides should be carried out in the spring and autumn when weeds are just beginning to emerge. Weeds can be a serious problem in pasture and paddocks causing grass to become overcrowded and unproductive. Weeds such as docks, thistles, ragwort, fat hen, buttercups, speedwell and nettles can start to grow in the best maintained paddock and pasture. Ragwort, a biannual weed, can be deadly to livestock and horses in particular. Selective herbicides will kill ragwort but it is essential that horses are not returned to pasture until the Ragwort has been eliminated and preferably removed. For more information on paddock weeds download our free guide . MC Country Services are fully trained and insured in all types of paddock and pasture spraying and hold the City and Guilds Part 1, Part 2 and Part 6 accreditation for application of herbicides and pesticides with tractor mounted and knapsack sprayers. Nowadays it is illegal to spray any professional herbicide or pesticide without these qualifications. Spraying herbicides and pesticides directly on to paddocks and grassland accurately is very difficult as unlike arable farmers there are no tram lines to follow. GPS systems makes our pasture spaying more accurate, efficient and cost effective. 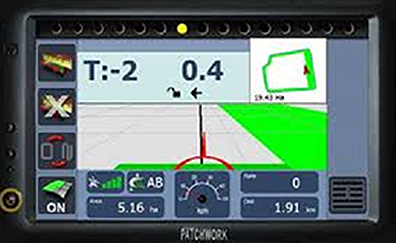 Patchwork GPS systems are fitted to all our compact tractors which tell the operator exactly where they are in the paddock and where to drive to give maximum accuracy. Bonus advantages are that the exact size of the paddock or field can be measured which, is useful for billing and an application map can be printed out to keep with your records. Depending on any particular problem with weeds or pests within the paddock, pasture or grassland we will use a variety of herbicides and pesticides. Advice on what spray we are using together with a copy of the manufacturer’s product information sheet will be given to you for your own records. Other information supplied will be the amount of chemical and water volume applied, wind speed and temperature. We will advise when you can put your stock or horses back on the pasture after we have completed spraying. We take herbicide and pesticide spraying in paddocks and pasture very seriously and always take into consideration all health and safety aspects before we start any job. These may include operator safety, people in the surrounding areas, wildlife, aquatic life, wind and other weather conditions which may affect save use of herbicides and pesticides. For further peace of mind we are a member of the National Register of Sprayer Operators, NROSO.